On Wednesday afternoon, I’ll be back in Austin, Texas, attending the state board of education hearings on textbook adoptions. I reported on the September hearings, which set the stage, but this week will bring Acts II and III, after which it may be curtains for Texas science textbook battles at the state level. Brantley Hargrove has a great piece in the Dallas Observer, surveying the long history of battles over Texas textbooks, and you can find another such history in Trey Kay’s radio documentary “The Long Game” or in the documentary The Revisionaries, which chronicled the 2009 and 2010 battles over science and social studies standards. To summarize a lot of history, though, Texas law gave the state board of education tremendous power over textbooks (and therefore over public education), and there were provisions opening the door for activists to interfere in the process. As Texas politics became more conservative, the textbook adoption process became a focal point for the culture wars. Every now and then, the political abuse of the process becomes too egregious, and lawmakers step in to try to weaken the board, but activists and board members find new ways to abuse the process for ideological ends. The adoption process ending this week will be the first science textbook adoption in a decade. Creationists on the board opened the door to abuses with the standards they passed in 2009, and lame duck board members after the 2012 elections snuck in ideologically-driven textbook reviewers. This summer, these reviewers attacked evolution and climate change in biology textbooks, looking to influence publishers and the board. The hope was that the board’s influence over purchasing decisions would be powerful enough to compel publishers to undercut the science. But publishers are stronger now. A 2011 law (passed in response to the absurd process in 2009 and 2010) allows local districts to buy any book they want, whether or not it’s on the board’s approved list. Districts are still going to prefer an approved textbook, but if the board goes too far, local districts can opt for a book not on the list, which means the publishers can walk away from the adoption process rather than weaken their textbooks. This science standards adoption is the first under the new law, a test case for battles to come (especially next year’s social studies textbook adoption). So far, the publishers are standing strong. Creationists pushed them to water down evolution coverage, but they seem to be finding ways around the reviewers’ suggestions. As Ron Wetherington (who won a Friend of Darwin Award from NCSE in honor of his work on the 2009 standards) told the Dallas Observer “I reviewed the publisher’s response to this. In this particular case, the publisher said, ‘Up yours, we’re not going to change anything.’” We don’t yet know whether the state education agency will accept that response and recommend these textbooks for adoption. This coming Wednesday will be the last chance for the public to speak about these textbooks. 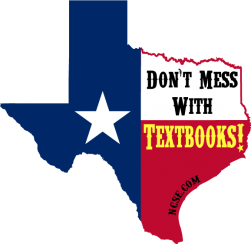 I’ve e-mailed NCSE’s members in Texas, urging them to sign up to speak at the hearing (it starts at 1 on Wednesday) and ask the board to adopt the textbooks without any further changes. 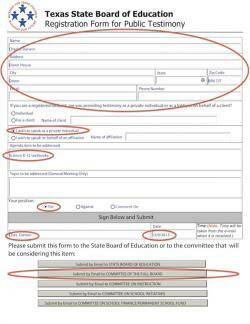 I hope that if you’re a Texan reading this, you’ll register to testify now (follow the sample form to the right), or at least attend and show your support for the people speaking up for honest science textbooks (non-Texans, kindly share this with your friends in the Lone Star State). No matter what, now is the time for Texans to contact the board by e-mail and tell them the same. On Friday, the board will take its final vote. With luck, they’ll listen to us, and Texan students will be able to rely on the textbooks in their science classes. By the time of the next science textbook adoptions, new developments in technology and in unified national science standards may render the Texas process irrelevant. And if the board chooses to ignore the science community and impose its political will on publishers, it’ll just hasten the end of the pivotal role Texas plays. Publishers who resist are likely to use their rejection as a marketing point, while those who make it onto the approved list are sure to be seen as compromised by teachers. In time, the “Texas edition” books will fade out of use as districts create their own adoption process. Almost no matter what, this is likely to be the last chance for creationists to mount a concerted attack on science education across Texas. As board member Mavis Knight told the Observer, “From a statewide perspective, this will be their last big shot.” And with everything at stake—a decade’s worth of science education—the creationists are sure to put up a fight. We need to match them. It’ll be a historic meeting, and I look forward to seeing what happens. I hope to see you there, or that you’ll come back for updates here on the blog, on NCSE’s twitter feed, and through videos of the hearing posted to our YouTube channel. Years from now, when people write histories of the Texas textbook battles, I dearly hope this meeting is reported as the last gasp of an ancient and ignominious tradition, and not as another moment when ideologues found a way around reforms. In the end, our actions in the next week will determine history’s judgment, and how tomorrow’s Texans learn the science they’ll need for a lifetime. Friday Flicks: What Makes a Scientific Achievement? This Week on Friday Flicks: Friend of the Planet Award Winner Greg Craven!